There’s no doubt Arm Wrestling has gone on in some form or another for thousands of years and is popular across the world. A test of strength of one person’s arm against another it consists of two people who stand at or sit down at a table and then grip each others hand whilst placing their elbows on the table. Their goal is then to pin their opponent's arm onto the surface (or touch pad) of the table. As well as being a test of strength, it takes a great deal of skill to be a competitive arm wrestler as well as psychological strength. There are various Arm Wrestling bodies and federations across the world by the main one is the World Arm Wrestling Federation who oversee the Arm Wrestling World Championships amongst other things and whose rules we refer to in this article. However, whilst not completely standardized across the world. Arm Wrestling rules are very similar amongst different authorities and federations and often differ only on the smaller, less important details. 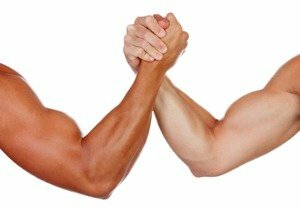 The actual mechanics of an Arm Wrestling match are essentially the same the world over. The object of arm wrestling is to beat your opponent by pinning their hand onto the table touchpad. This is done by a combination of strength and technique. Despite armwrestling being primarily a strength sport, it can be highly psychological, with players ‘psyching themselves up’ into peak mental condition as well as often trying to intimidate their opponents or put them off their game. In the World Arm Wrestling Championships, competitors, as well as trying to win their own individual matches are attempting to score points for the country’s team in the competition’s team championship. Because their is a correlation between physical strength and size, competitors compete with each other in weight classifications to ensure that matches and competitions are fair. Players are also required to dress appropriately, with them wearing short sleeve or sleeveless shirts and sports pants with little or no advertising. No jeans are allowed to be worn and neither are any kind of arm, elbow or wrist support. Elbow pads - These are where each competitor places their elbow down to wrestle. They are padded to avoid discomfort and to prevent injury. Touch pads - These are the raised pads are on opposite sides of the table that each respective competitor is trying to push his opponents hand onto. Hand pegs - These are used by competitors to grip onto whilst wrestling, thus giving themselves some added leverage. The type of arm wrestling table used is different depending upon whether the arm wrestling is to be done standing up or sat down. For sit down competition, the tabletop should be 28” from the floor. For stand up matches, the table top should be 40” from the floor. All the other dimensions are the same, which are that the table top should be 36” long and 26” wide. Legs should be a minimum of 28” inside leg and a minimum of 18” leg to leg. Elbow pads should be set 2” from the edge and should be 7” x 7” and 2” thick made from high quality and thick foam. Touch pads should be 10” long by 4” high and should be on an angle, 5" out from the inside corner of the elbow pad to the inside corner of the pad. Hand pegs should be placed halfway at 13” on the edge of each table and chairs too should be a regulation size of 18” square and 18” from the ground. A line should also be placed across the centre of the table to distinguish the two halves of the table and should be painted or taped onto the table. In individual matches, the winner of the match is the competitor who pins their opponent’s arm onto the touch pad. In the Word Arm Wrestling Championships each match is just one round long but in other Arm Wrestling competitions under different federations, rules and regulations, matches may be fought on a ‘best of three’, ‘best of five’ or an alternative basis. In the team competition in the World Armwrestling Championships, the winning team is the team who has earned the most points from their members performance in their respective individual events. This is often the case for other types of arm wrestling championships and competitions. Each match is officiated by two referees, one on each side so the officials can see the competitors and their grip from both sides. There is no time limit to a match but a referee may call a halt to the match if one or both competitors are in his opinion not in a fit state to carry on. The competitors should approach the table, make themselves comfortable and then grip their opponent's hand. The grip should be palm to palm with the thumb knuckle visible. The competitors other hands should grip their respective hand peg. Competitors can choose to start a match in the referee's grip or in a strip but both competitors must agree to this. Once the referees are happy with the grip from both competitors, the contest will begin. Each competitor should attempt to pin their opponent’s arm onto the touch pad. Pressure should be in a sideways capacity to force their opponent's hand to the touch pad. Back pressure in an attempt to drag the opponent off toward the centre of the table is not allowed. The match is won when one competitor pins their opponent’s hand onto the touch pad. At this point, if the head referee is happy that it is a valid pin, they will shout ‘Stop!’ and indicate the inner by immediately raising their arm. A valid pin is when any part of the competitors natural wirst touches the touch pad. There are numerous fouls that can be committed in Arm Wrestling. These include touching a part of your own body during the match, crossing their shoulder into the opposition area, dropping the shoulder below the height of the touch pad, foul language, abuse or poor sportsmanship to name a few. Two warnings = one foul and two foul equals disqualification meaning that their opponent immediately wins the match.